An intriguing glimpse into our American identity awaits travelers in the picturesque village of Boalsburg, Pennsylvania. Eight generations of the Boal family have lived the story of America, and even have a tangible family connection with our famous founding father, Christopher Columbus. As visitors drive up the long, gravel driveway of the 200-year-old Boal Estate beneath the ancient oak and maple trees, they begin their own voyage of American discovery. Few realize at first glance the incredible family memorabilia, authentic and intact, they will be experiencing during their one hour visit. Most leave saying "This is amazing! Why haven't we heard about this before?" The Boals were on the cutting edge of the defining issues of their time. David Boal, the founder of the site, was a Scottish-Irish pioneer seeking cheap land and freedom. He founded Boalsburg village and had a tavern there which delighted weary travelers and locals alike. His son, George, was a farmer and in 1852 was one of the founders of the nearby Farmers High School, now better known as Penn State University, home of the famous Nittany Lions football team. All of these institutions -- the Boal estate, Boalsburg village, Penn State - remain vital to the community today. The fourth generation, Theodore Davis Boal, benefited from industrial fortunes amassed by the third generation. He studied architecture in Europe where he married the beautiful French-Spanish aristocrat, Mathilde de Lagarde, a descendant of the famous Christopher Columbus. In 1909 Terry and Mathilde inherited and imported to their American estate the chapel of the Columbus family, including an admiral's desk said by the family to have belonged to the famous explorer himself. Fifteenth century religious statues, sixteenth century Renaissance paintings and two pieces of the True Cross of Jesus await the visitor. 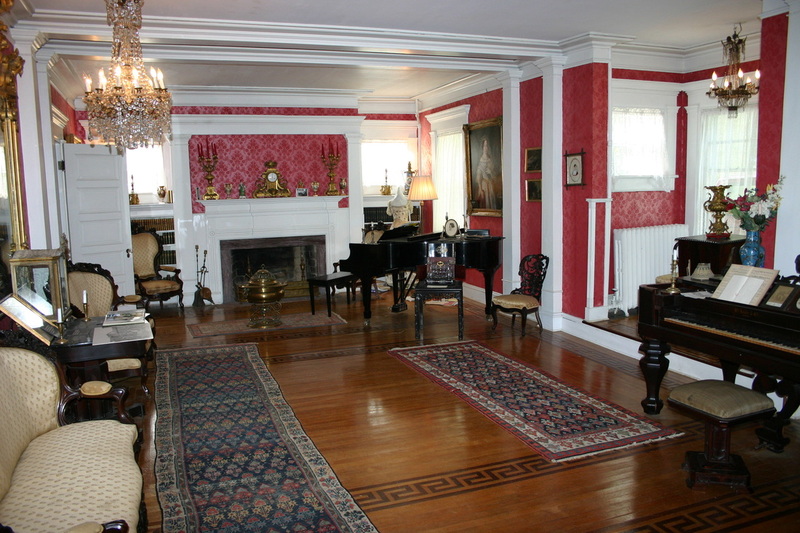 The Boal Mansion Museum contains the original furnishings, papers, portraits, tools and weapons of nine generations of this American family. Click here to take a virtual tour of the mansion.